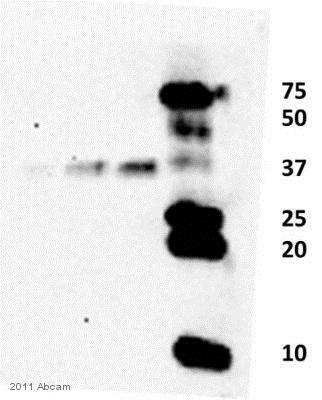 Recombinant Human CBR3 protein (ab86848) can be used as a positive control in WB. HEK293 cells. Our Abpromise guarantee covers the use of ab39279 in the following tested applications. WB Use a concentration of 1 - 3 µg/ml. Predicted molecular weight: 31 kDa. Detected in ovary, pancreas, intestine, colon, kidney, brain, thymus, lung, heart, liver, spleen, leukocyte, prostate and testis. ab39279 has not yet been referenced specifically in any publications. Publishing research using ab39279? Please let us know so that we can cite the reference in this datasheet.